Who doesn’t love sweet peas? For me I think it is an addiction! I cannot walk past sweet peas without burying my nose in the blooms and taking a breath full of their delightful perfume. We all love them but lots of people do not have the confidence to grow them themselves and yet if you follow a few simple rules you too could be out in your garden picking your own sweet peas. You can plant the seeds early but another option is to buy a pot of seedlings very inexpensively. We grow them in small pots with about 10 plants all packed together. Pinch out the tops of the seedlings if they are getting tall and floppy. This will make a stronger plant in the long run. Planting. Empty the whole pot gently into your hand then gently squeeze the compost so that you can tease the seedling’s roots apart. In a pot there are usually about 10 seedlings and you need to plant them all separately. The seedlings need to be about 8cm apart. Sweet peas need sunshine and support. Find a place where you can grow them up a trellis or fence in the sun. If you are limited for space then put a few in a pot with an obelisk or a circle of canes to grow up. Sweet peas need to put their roots down deep so make sure the ground can accommodate this. If you are planting in a pot then make sure it is not too shallow. I once had a disaster as I grew them against a south facing wall but a few inches below ground the builder had left a load of rubble. I wondered why the plants never really thrived! Make sure that you dig the soil over carefully and add good compost to the ground. Once you have planted the seedlings then give them a good dose of ‘Blood, Fish and Bone’. WATER, WATER, WATER! It is important to keep the ground damp but not so wet that the roots rot. Pinch out the side shoots. As the plant grows so it will put out lots of side shoots. Tie the main stem onto the trellis or wire support. This stops the plant becoming top heavy and, very importantly, makes sure the energy will go into the flowers instead of an unnecessarily large plant. PICK, PICK, PICK! The more you pick the more it will flower. If you leave the flowers on the stem and they go to seed then the plant will think the season is over and stop producing. Inevitably you will find that you have missed a few and that there are seed pods (these look like mini pea pods). Cut these stems off too if you want the season to last longer. Use sharp scissors to pick. Sometimes I have been tempted to pick a few by hand as I am passing – but what a mistake! You risk pulling over a whole plant. The scissors also mean that you can cut a longer stem. As the season goes on so you will find that the stems are shorter – but I just adjust the type of vase I use! On a personal note I like the simplest of vases for sweet peas. My favourites are milk bottles and jam jars. For me the sweet peas speak for themselves! There are a few other things you might like to think about. 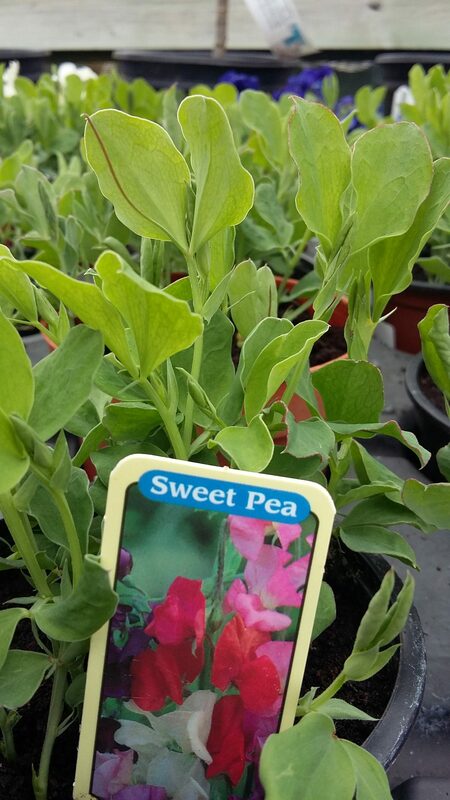 You can buy a special type of sweet pea seed that is especially designed for pots and hanging baskets. These are very pretty and are ideal for small spaces but you might find that you have to compromise on the scent. I also have a perennial sweet pea in the garden. This is great because it comes back every year (even when I am getting behind and I have not managed to plant out annuals) but again it does not have such a good perfume. It also only flowers in a pink colour. One of the things I love about the sweet peas is their beautiful mix of colour. 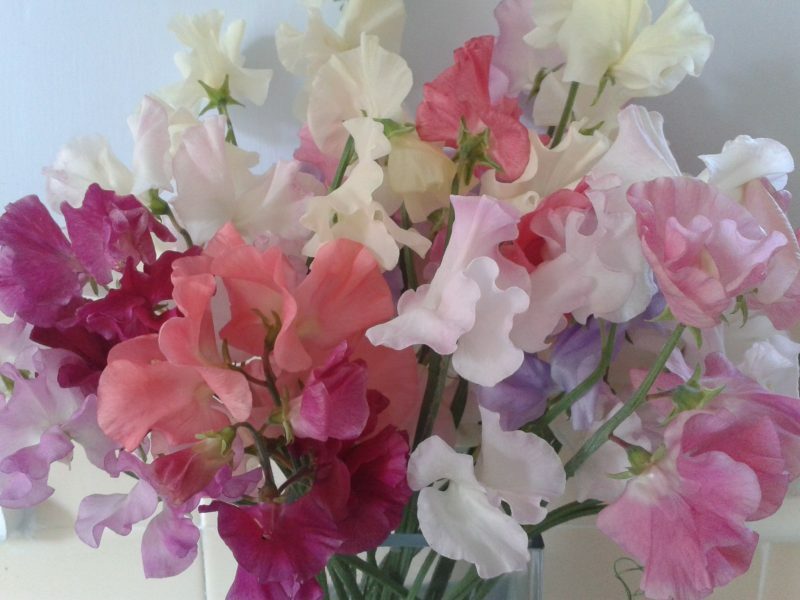 So it is always worth checking the variety of sweet peas and make sure that the description specifies whether it has been bred for scent or colour. Well I hope you too enjoy sweet peas in the garden and on your windowsill. If you have enough to share, I am sure that you will find that a gift of a bunch of homegrown sweet peas to a friend will bring more joy than you can imagine!